On Christmas Day I set the last piece of subroadbed in place at the top of the helix which, in turn, fixed the highest point on the mainline. 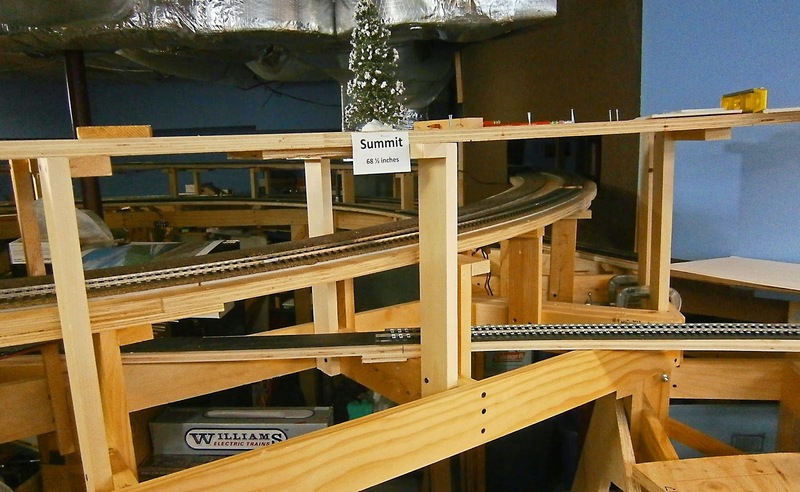 The height at the summit is 68 1/2 inches above the floor. Here's a picture - decorated for the occasion with a department store bristle-brush tree. 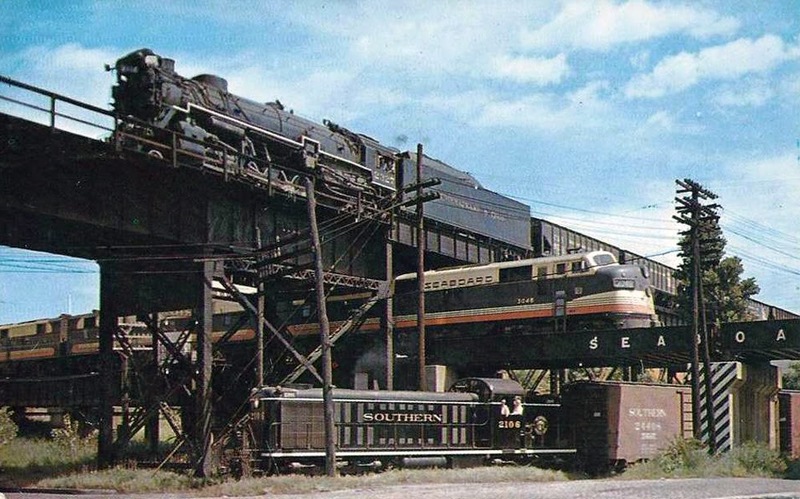 The initial planned altitude at this point was to be a bit higher, but as the two ends of the railroad approached each other, it became apparent that the height difference between the two ends was larger than planned. Therefore I reduced the grade on the last part of the upper turn of the helix in partial compensation. In fact. the clearance between the decks of the helix at the point of the sign is only 4 3/4 inches vs. the NMRA recommendation of 5 1/2 inches, which I maintained almost everywhere else. As I don't intend to run double stacks or tri-level auto racks since they are out of my time period, this should not be much of a problem. Another thing struck me today. This track arrangement reminds me of the three-level railroad crossing in Richmond, Virginia; which I visited earlier this year. Any similarity is unintentional, however. Here's a couple of pictures of the crossing in Richmond. There is a canal below the crossing too, just to make this a really unique site. Today the area around the crossing is in a park. Unfortunately, all three tracks are not active as the lowest track, now owned by Norfolk Southern, ends just beyond the crossing. The upper two tracks are in daily use. 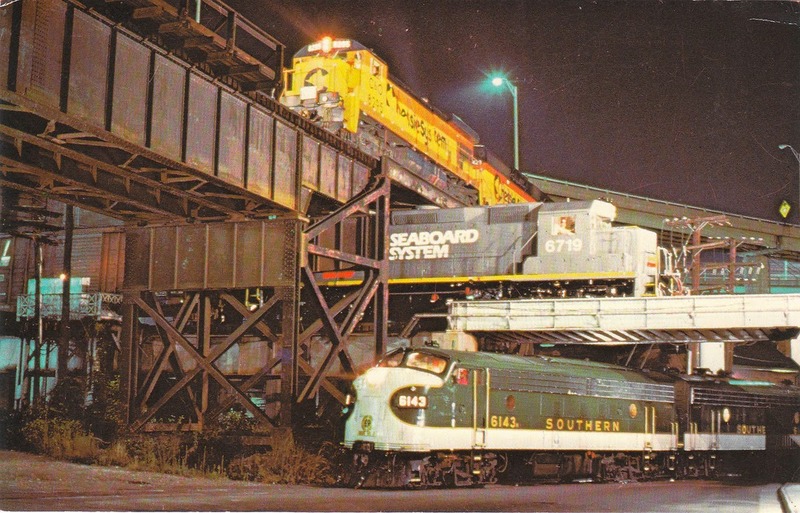 Technically, though, since the grade-level track does still pass beneath, it's still a triple crossing. Back on my layout, the lower two levels will be covered and out of sight. And, no, I'm not going to alter the plan (already did that too many times) to make this into a scenic feature!